I’ve noticed that not everyone knows what a gate map is, or how to use it. A gate map is a handy illustration of what a dungeon’s possible levels may be, and can always be accessed from inside the dungeon itself. So here’s an illustrated guide to gate maps. This totem pole isn’t the gate map, but it’s a quick legend to see what’s available in the gate, and what to prepare for it. Fortunately, between each icon, there’s a resting point where you can change to more appropriate gear for the next set of levels. The pattern is: between the first and second icons, there’s a Clockwork Terminal; between the second and third icons, there’s Moorcroft; repeat the pattern for the second Clockwork Terminal and Emberlight; and so on, until the Core. 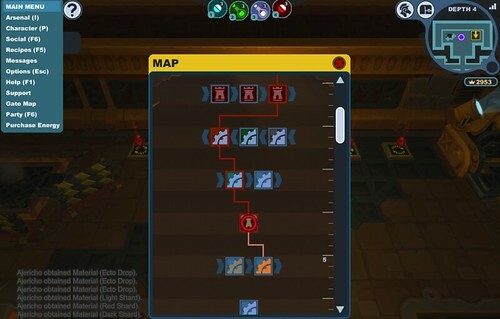 You’ll see that the gate map consists of icons in rows. If you hover over each icon, you’ll get the title of the level, which is an indication of what you’ll face there. As for the icons themselves, here’s what each of them mean. Towns. Currently these are Haven, Moorcroft Manor, and Emberlight. You recover all health bars on entering these towns, and can buy things. Clockwork terminals. You can recover all health bars by standing on healy things, and can buy recipes from the traveling merchant there. The deeper you go, the higher-star the recipes are likely to be. A monster-themed den. These include wolvers and lichen at the moment. 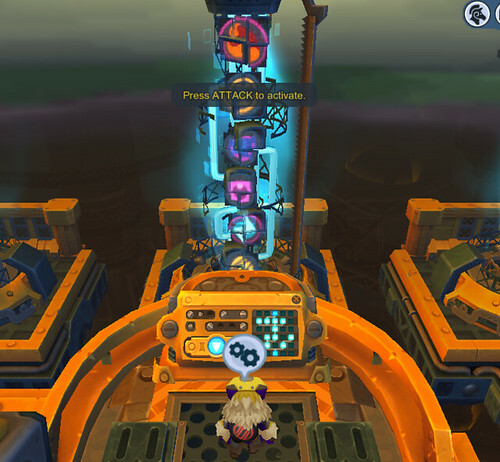 Clockwork levels with monsters, not to be confused with the terminals. This can include slimeways, mechanized miles (constructs), haunted passages (zombies and large evil butterflies, aka greavers), and deconstruction zones (gremlins en masse). A city level. This can either contain poison zombies (complete with totems of resurrection) or the devilites living Dilbert-like lives amongst the post-apocalyptic rubble. Treasure vaults. There are no monsters here except those durned kleptolisks, and there are tons of coins, treasure boxes galore, minerals, and awesome music that really, really encourages you to get all the loot. A graveyard level. Lots of zombies in graves, and the ever-annoying, unkillable, and deadly phantons. Arena levels, consisting of three danger rooms, each spawning more dangerous monsters than the last. Castle levels. Except kat ghosts. Grassy levels; either the sky islands (Aurora Isles) or the Jigsaw Valley. Expect slimes, wolvers, and treebeasts against a happy blue sky and green grounds, all trying to kill you. Elemental themes can be discerned here also, and in more fine-grained level-by-level detail; if you see “shock” or “power”, for instance, expect shock to play a major role. Fire and ice are pretty obvious. Each row of icons represents different possibilities for each level in a dungeon. You see, the clockworks are a fickle place, so there’s a regular rotation or outright lottery of which level you’ll encounter next. In the case of “<” and “>” you can even wait by the elevator for the destination level to change. I like to use this to avoid arenas while soloing, because I can never get the hang of soloing a Trojan, even though I did it once (and only with the help of a temporary pet Mechaknight). However, if you see “?” symbols between icons in a row, you won’t be able to see what level you’ll get next. 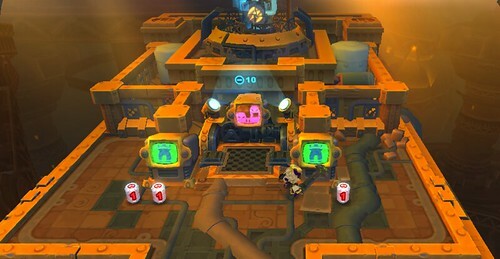 Typically the lottery includes a treasure vault level, a graveyard, and one or more arenas or normal levels. You can also see the gate map while you’re in the dungeon itself, at any time. This is useful for figuring out which level you’re currently on, and what levels you’ve visited. The red line indicates where you’ve been, the path you’ve taken through the dungeon. A red circle indicates your current level. The tan/pink line represents your next level if it’s not part of a “?” row. And just as before, hovering over the icons will tell you the level titles. And that’s most of what you need to know about gate maps. Thanks for the diary – you’ve gotten me interested enough to sign up! You’re welcome! I’m glad this information is useful. I know I scratched my head for a while on these matters. Is there anyway to skip to deeper lvls of the gate map you have already done? Yes, when you’re starting out in the Arcade. 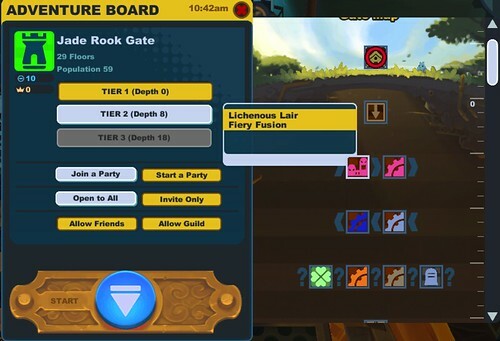 On the “Adventure Board” side of the party creation window, you can select which tier you’re going to start out with. So Tier 1 means you begin from Haven; Tier 2 means you begin from Moorcroft Manor; Tier 3 means you begin from Emberlight. You can’t skip levels while you’re in the dungeon. Never notice you could view the Gate maps whilst in dungeons, I’ll take a look tomorrow about that! When it raises its sword, run around to the back and spam with your sword(I use a Cutter. LIGHTNINGFAST). My method of soloing a Trojan is to set a Blast Bomb next to it, then run around in the space of time before the bomb explodes so that its back is to the bomb. KAPLOW! Rinse and repeat. But that’s true, a Trojan is a fiend, so yes, a Flourish to the back should do the job quite nicely. But I find that my reflexes are too clumsy to get around him quickly enough to spam him to death with a sword. Thank goodness for bombs! Your blast bomb technique is fascinating. I can’t wait to try it out! Up to now, my main strategy involved … a lot of running in circles and flailing, really. It works, but it’s exhausting. Glad to have something new to try.